When my kids were little they would sit outside and crack the pine nuts which burst from the cones as they fell to the ground. Each pine nut had its own tiny casing, shrouded in purply black powder. 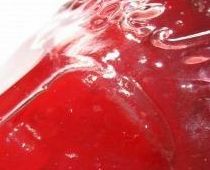 The children’s fingers, faces and clothes were sooty with this powder in the early summer when the pine cones were ripe. They cracked the casings with a small rock, extracting each tiny kernel. This was a tricky business; many kernels were gobbled up smashed. The whole ones were presented to me with enormous pride. If the children worked very, very hard we would have 10 or 12 pine nuts to toast for the salad that evening. But in some ways these fresh nuts were best eaten raw, redolent of resin. Bought pine kernels are fine for making pesto, giving it a lovely, creamy texture. I’ve used almonds for this one for a crunchier effect, but feel free to substitute. 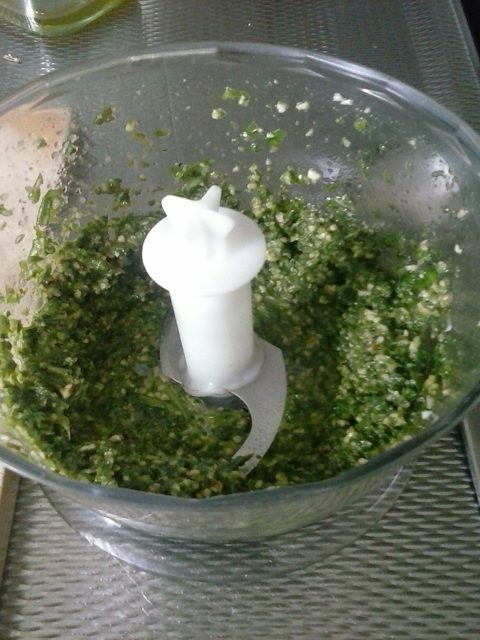 In any case homemade pesto is a totally different animal from shop bought. This is so intensely chlorophyll: try to get a basil plant from a farmer’s market in the summer, so that you know it has seen some sunshine. Add freshly grated Parmesan for its sweet saltiness and a little raw garlic to give it an edge. Put everything except the cheese and the seasoning in a blender and whizz until smooth. Make sure the garlic has been completely absorbed into the paste. As with the red pesto recipe, a small blender works really well for this. Spoon into a bowl and stir in the cheese. Serve with pasta or grilled vegetables. Also great spooned into soup.